Observation - Beetle - UK and Ireland. 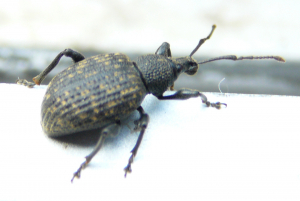 Description: looks like a wood beetle, a little like a weevil, but with only a short proboscis, pictured crawling overa sliding door sill to the outside. Slow moving. looks like a wood beetle, a little like a weevil, but with only a short proboscis, pictured crawling overa sliding door sill to the outside. Slow moving.